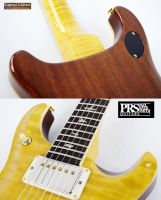 Offered here is a PRS model that we are quite fond of, a McCarty 594. In this case, a 2018 Wood Library "10 Top" model that is brand new and in unplayed condition. 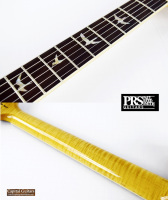 This particular 594 is from PRS' "Wood Library" collection and has a "10" grade top made from a single piece of highly quilted Maple. This one also has a Brazilian Rosewood fretboard that is so dark it looks like Ebony. The neck is made from highly flamed Maple. It comes in a killer Honey finish and has a total weight of just 8.0 pounds. ​This is a guitar that can easily replace your Les Paul should you be so inclined. It sounds as good or better, plays far better, is built to much higher quality standards, is at least a pound lighter and many would argue is far better to look at than an LP. 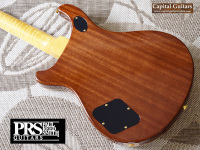 The 594 is named for it's unique string scale, 24.594", making the scale length of this model just under a 10th of an inch longer than the McCarty's typical 24.5". It's still a short scale, 22-fret design, but that tiny bit of added scale length generates a bit more clarity and brightness in the guitar's tone and is just one of the many little details that makes this model special. Another key detail to this design are the electronics. The PRS 58/15 LT pickups are a lower wound humbuckers with a vintage output that again makes for a cleaner tone. 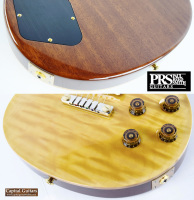 PRS then added coil splitting, along with separate volume and tone controls for each pickup in order to provide nearly unlimited tone adjustment capabilities. Further, they put the three-way toggle in the upper bout of the guitar for purposes of player comfort. The neck shape is called "Pattern Vintage." It's a chunky neck shape that is slightly asymmetrical with a little more mass on the bass side of the neck versus the treble side. This example has depth measurements of .89" at the first fret and .99" at the twelfth. 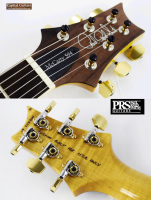 Finally, PRS gave the 594 their own version of the familiar Tune-O-Matic two-piece bridge and tail piece setup. This design allows for maximum adjustment of string height and intonation. This design, along with the very effective PRS locking tuners, makes for extremely easy string changes. Play this guitar and you immediately feel comfortable with the design. It feels very LP-like, but with a precision and physical beauty of a high-end PRS guitar. The tone is lovely clean, but has fabulous character and bite when gain is added. You can move between thick humbucker tones and single-coil clarity at will. All the cool details PRS put into this design result in a guitar that is so much more than just the sum of the components. This guitar is fresh from a dealer and is in mint, unplayed condition. 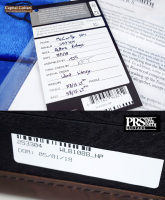 It comes in it's original PRS black paisley case with the tools and all of the original paperwork. 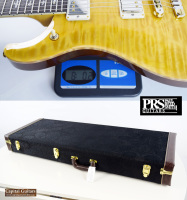 Get yourself this superb PRS 594 in new and unplayed condition for a grand $ less than a new one. Very nice indeed!